Once the crisp fall days started rolling in, all I could think about was how would I wear my knits for fall. Knit and sweaters are just my favorite thing to wear. It has something to do with the warmth an cozyness that only a chunky and oversized knit can give you, combined with the excitement of the new season. When October hits, we only got so many days where we don’t need to wear an actual jacket on top of our pretty sweaters, so I like to take advantage of it these early autumn weeks and wear as much as possible my favourite knits for fall. It still amazes me how the trees change and how beautiful it can get once the leafs start changing their colour. Growing up not having an actual Autumn makes me admire it even more, so here is where part of the excitement comes from! I like to dive heads in into the sweater weather and adopt (even more) earth-tone pieces to my daily wardrobe to blend in with the trees! 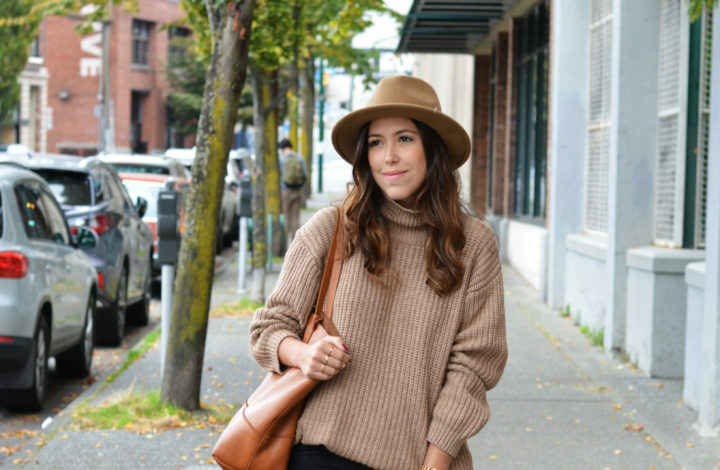 Here is how I combined it all together wearing one of my go-to Knits for fall, a camel oversized turtleneck sweater!